Jack Tworkov’s Drawing No. 3958 (1954), currently on view in the exhibition Artists in Exhile: Expressions of Loss and Hope at Yale Art Gallery, New Haven, CT.
Artists in Exile: Expressions of Loss and Hope presents an innovative approach to the theme of exile, considering artists who left their country of birth, or their adopted home, for a variety of reasons—including discrimination, war, and genocide—from the 19th century to the present day. 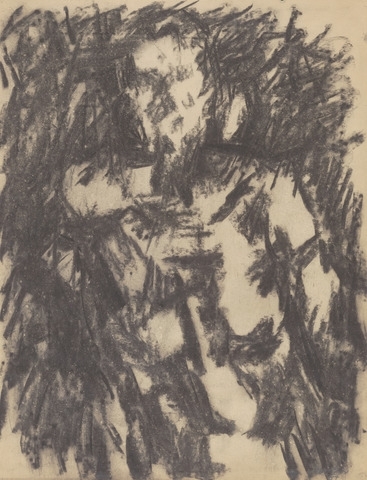 The exhibition explores exile as not only a mental or physical state but also a catalyst for creativity; indeed, for many artists, separation from the familiar, either willing or unwilling, inspired innovations in form and technique. The installation features works by such well-known European artists as Jacques-Louis David, Gustave Courbet, Paul Gauguin, Josef Albers, Kurt Schwitters, Marcel Duchamp, and George Grosz, while also advocating a more global perspective through works by Arshile Gorky, Matta, Elizabeth Catlett, Ana Mendieta, Mu Xin, Shirin Neshat, An-My Lê, Mona Hatoum, Abelardo Morell, and Ahmed Alsoudani, and paying notable attention to female artists. The majority of the objects on display are drawn from the Yale University Art Gallery’s encyclopedic collection, enriched by the addition of key loans from other institutions and private collections.